The son of murdered Belfast solicitor Pat Finucane has said his father was killed to “silence other lawyers”, The Irish News reports. 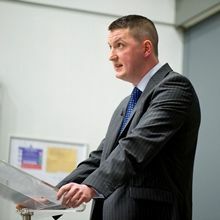 John Finucane, himself a lawyer with Belfast-based Finucane Toner Solicitors, spoke at an event at St Mary’s University College in west Belfast on Saturday to mark the 30th anniversary of the murder. Pat Finucane was shot and killed in his home on 12 February 1989 by loyalist paramilitaries. In 2012, then Prime Minister David Cameron acknowledged that there had been “shocking levels of collusion” with security forces in the killing. Mr Finucane’s work as a criminal defence solicitor had seen him represent convicted IRA members, families of those killed by security forces, and hunger striker Bobby Sands. John Finucane, a schoolboy at the time of his father’s murder, told the event: “It was a deliberate decision to kill him, to silence other lawyers and prevent them from doing that type of work. “What we see now is a generation coming through with lawyers, people wanting their human rights. I think that is very much a legacy of Pat Finucane and what he stands for and represents. The Finucane family is awaiting a ruling from the UK Supreme Court on their bid to force the UK government to grant an independent public inquiry into the killing.